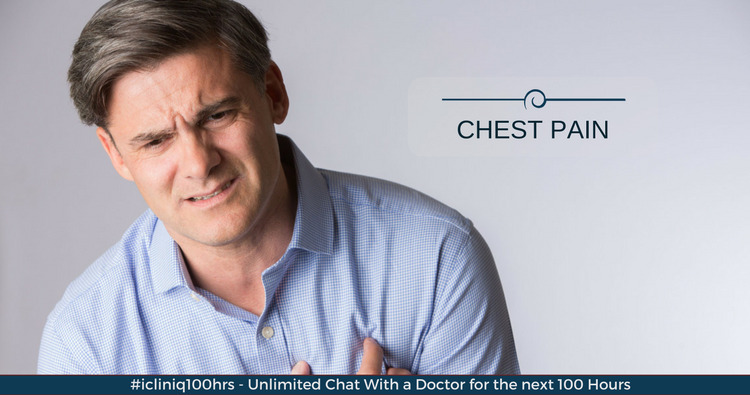 iCliniq › Ask a doctor online › Answers › Cardiology › Chest Pain › Chest pain since 15 days. ECG & TMT reports are normal. What could be the problem? Q. Chest pain since 15 days. ECG & TMT reports are normal. What could be the problem? Answered by Dr. Rohit Jain and medically reviewed by iCliniq medical review team. I am having chest pain since 15 days. My ECG & TMT reports are negative. But still I am suffering with the pain. Please suggest me the appropriate treatment. • I coughed up yellow phlegm and the area over my right lung is paining. Is it lung cancer? Chest pain might be due to many reasons other than heart problem (primarily pleuritis - swelling of the lung membrane due to infection). Get your CBC (Complete Blood Count) and chest x-ray done to rule out this cause. Do massage on the affected area with a pain relieving cream/gel (Example : Bengay, Volini gel). Take tablet Zifi 200mg twice daily for 5 days. In chest x-ray, what is the meaning of bilateral apical inhomogeneities? Does my chest x-ray show any nodules of concern?